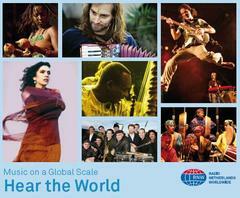 Hear the World is your listeners' window to great live music - on a global scale. Host Dheera Sujan expertly guides listeners on a music expedition made up of exclusive live concerts not available anywhere else. Hear the World brings you music on a global scale, you’ll get: Neco Novellas, Netsayi, Nina Ogot & Daby Touré. In this programme, the focus is on Caribbean sounds. We listen to the music of the islands of Cuba and Curaçao. Familiar and less well-known sounds from Brazil. Music from Israel and Congo: Gilad Atzmon (UK/Israel); Avishai Cohen (Israel); Papa Noel & Bana Congo (Congo/Cuba). In this programme exciting rhythms and festive sounds from Brazil and the island of Cuba. Reena Shrivastava; Trilok Gurtu & The Glimpse; Debashish Bhattacharya. Music from Curaçao and African music from Niger and Mali. Marcos Suzano & Hamilton de Holanda (Brazil), Drums United (Netherlands) and LA 33 (Colombia). Etienne Mbappe (bass) from Cameroon, Richard Galliano (accordion) from France and Chucho Valdes (piano) from Cuba. A program featuring Indian raga with recordings from the recent Amsterdam India Festival. Monajat Yultchieva from Uzbekistan and Savina Yannatou from Greece. The world famous jazzrock and fusion drummer Billy Cobham was born in Panama in 1944, but since the age of three he has lived in the United States.